Tamara Goura at CrossFit Creature. Zoe, the dog, Brett Snyder and Bryce McMichael. Ivan Garcia's first competition after losing 100 lb. "Cutting Sugar Improves Children's Health in Just 10 Days," The New York Times. CrossFit Level 1 Certificate Courses: CrossFit Strong, CrossFit Roots, CrossFit Orlando, CrossFit Omaha, CrossFit King of Prussia, Reebok CrossFit One, CrossFit Ethos, CrossFit Rife, CrossFit Basel, CrossFit LCS, Myleo CrossFit, CrossFit Chiwoo, CrossFit Long. CrossFit Level 2 Certificate Courses: South Loop CrossFit, Trident CrossFit, Reebok CrossFit LifeSpark. 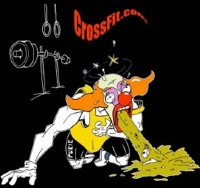 CrossFit Kids Courses: CrossFit Vitality, Punk CrossFit. Cory Dawson at Grind City CrossFit. "Coca-Cola's sneaky, evil politics: How Big Soda twisted race and used the Koch Brothers to fight a tax" by Tom Farley, Salon. CrossFit Level 1 Certificate Courses: CrossFit X-Factor, CrossFit Mayhem, CrossFit Chickasaw, CrossFit Columbus, CrossFit Monrovia, CrossFit Jääkarhu, CrossFit Closer, Reebok CrossFit Plaza Condesa, CrossFit STHLM, Reebok CrossFit Officine, Reebok CrossFit 33100, CrossFit Melbourne, CrossFit Crescent, CrossFit Body in Motion, CrossFit Insurrecto, CrossFit 1810. CrossFit Level 2 Certificate Course: CrossFit Chiwoo. Post time and number of minutes. Dustin Kaufman, Leroy Yoder and Anthony Kaufman, members of 924 CrossFit. 2015 Reebok CrossFit Games to air on television, starting tonight from 5-8 p.m. PT. 11 clean and jerks, 155 lb. Share the work with your partner however you choose with only one person working at a time. If you can't find a partner, perform 5 reps of each exercise per round and find a heavy sandbag to carry. Learn more about the Heroes 4 Horton fundraising event. CrossFit Level 1 Certificate Courses: CrossFit Atlanta, 810 CrossFit, CrossFit Tarpon Springs, CrossFit SouthEnd, Rainier CrossFit, CrossFit Lackland, CrossFit Morristown, CrossFit St Paul, CrossFit Ranch, CrossFit Calgary, CrossFit GVA, CrossFit Banda, CrossFit Little Hell, CrossFit Rev X, CrossFit Chiwoo, Reebok CrossFit MeWellness, CrossFit Jozi East, CrossFit Cidade Jardim. CrossFit Level 2 Certificate Courses: LaLanne Fitness CrossFit, Reebok CrossFit One, CrossFit Twente. CrossFit Kids Course: CrossFit Orange County, CrossFit Ciudad Real. Kelli Weight, Mt. Timpanogos Summit, Utah. "Researchers have discovered a surprisingly simple way to get kids to eat more veggies," The Washington Post. CrossFit Level 1 Certificate Courses: Peak 360 CrossFit, CrossFit ONE Nation, CrossFit Defined Lincoln Square, CrossFit Big Easy, Trident CrossFit, CrossFit Columbus, CrossFit Strong, CrossFit Hawaii, CrossFit Silicon Valley, CrossFit Getafe Capital Sur, CrossFit Da Vinci, CrossFit Auckland, CrossFit Herzliya, CrossFit Yas, Reebok CrossFit Heart and Beauty, CrossFit 506. CrossFit Level 2 Certificate Courses: CrossFit Roots, CrossFit Morristown. CrossFit Competitor Trainer Course: CrossFit Soul Miami. CrossFit Kids Course: CrossFit Chiwoo.